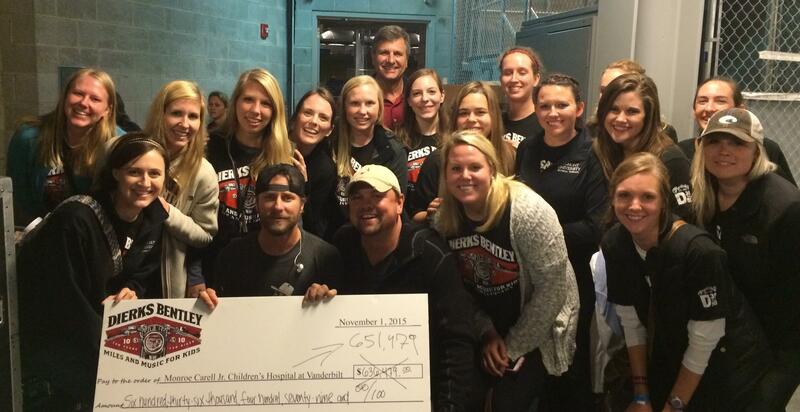 Belmont University’s School of Physical Therapy partnered with the annual Dierks Bentley Miles and Music for Kids motorcycle ride and concert to benefit Vanderbilt Children’s Hospital on Nov, 1. The event is the unofficial kick-off to the biggest week of the year in Nashville–CMA week. This year marked the 10th year of the annual event, with Belmont’s PT program assisting as volunteer staff since its inception in 2006. In the past decade, the ride and concert has raised more than three million dollars to help Vanderbilt Children’s Hospital and has gone to support the hospital’s pediatric palliative care program. The program supports the hospital’s sickest patients, many of whom are facing the end of life. This money enables families to focus on their kids. “Money raised goes to families so they can focus their prayers on their kids getting well and not have to worry and pray about money. There is so much positive energy there and so many great doctors,” Bentley said. Before his performance, Bentley brought Dalton Waggoner, a patient at Vanderbilt since his congenital heart defect diagnosis at two-days-old and Miles and Music inaugural participant, on stage. “Dalton is the riser of the night,” Bentley told the crowd, referring to his song “Riser” about resilience in the face of adversity. At the night’s end, Bentley brought Waggoner back on stage for the $636,479 check presentation, a total that made the event the most successful one yet.